Ordo was just about to start one of his daily meditations in his inner chamber, as the communication holoreel flickered to life and a holographic image of his superior, the Lord Admiral Lok’ri came to life.”Captain Ordo”, he stated calmly, as always. “Admiral”, Ordo said, offering a bow with his head, still in his sitting position. 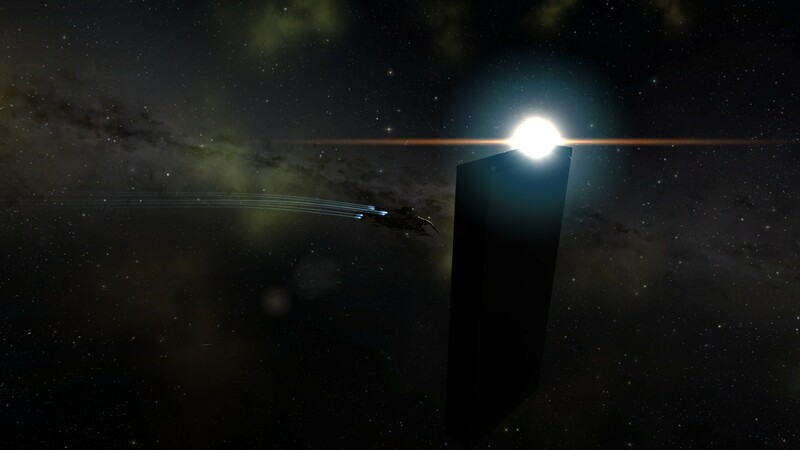 Ordo blinked and confirmed the admirals call and the holographic communication disconnected. He stood up and started walking out of his chamber, heading towards his own personal cloning facility. Raphael willed his Vengeance class assault ship, TES Dark Sefrim, towards the incoming artillery fire that hammered his ship’s armor. His course changed and with a single thought, Raphael turned on his Micro Warp Drive, turning his ships velocity to almost 3000 meter/second. 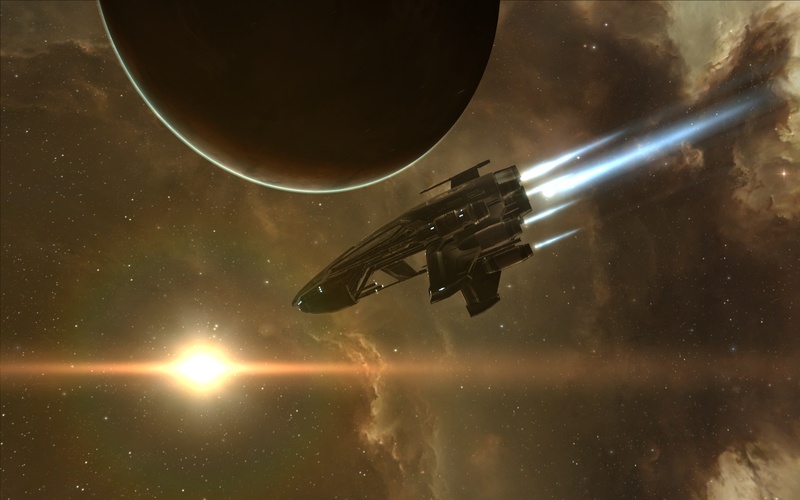 He was heading towards the Minmatar capsuleer. Fast. Guiding his vessel in the wake of the Thrasher class destroyer, Raphael now orbited it up close, activating his rocket launchers on a whim. A wide grin emerged on his face as his camera drones captured the beautiful scenery of Minmatar rust being redefined to dust by the very blast and fires that his rockets delivered as they smashed the enemy ships hull. The Thrasher was destroyed within minutes, and while the capsule of the pilot ejected and escaped unharmed, Raphael deemed himself victorious. The military complex was defended, and only a handful of enemy ships remained in their holy grasp. His consciousness slowly coming back to him. Memories regained from his combat clone slowly took their place within his head, as he sat up straight in the metallic chair. He praised these memories even more than usual, as they should have inherited all the lessons he gained during his last mission in his other body. Although Ordo trusted the technology he was using, he couldn’t help but to think that some fragments of his thoughts, his humanity and his very being – were stripped away every time he used the “Jump Clone” technology by changing his conciousness to another clone of his. “These memories wasn’t experienced by this body”, he said to himself in his head, while staring on his hands. Ordo came back from his deep thoughts as a one of his service men called on him, telling him he had another encrypted holographic transmission coming through. He made himself stand up from his chair and walked out of the cloning facility, heading back towards his inner chamber. Raphael woke up with a rush, sitting straight up in his bed, his heart fast pounding inside his chest while he noticed he and all his clothes were soaking wet. Docked in the Sarum Family Assembly Plant station orbiting Sharhelund VIII, Raphael found himself in his familiar private suite he was provided by the Imperial Navy, taking a break from all the missions, all the killings, all the destruction that occured in his everyday life. He must have fallen asleep, and had a bad dream, he thought. Pushing away any other explanation, Raphael slowly walked to his bathroom, washed his face and looked into the mirror. With each new clone, he imagined something was altered. A thought he often pushed away immediately in an attempt to remain sane. Touching himself on his surgical scar on the left side of his scalp, he briefly thought of the new amarrian neural cybernetics he had implemented inside his brain, that were to enhance his neural activity and block out disturbances – further enhancing his combat ability. The implant itself was so big and powerful that it usually interfered with his vision on his left side, thus each clone had the left eye socket replaced with an artificial eye. Further down his neck, right below his atlas, he felt the characteristic capsuleer sockets. Fully augmented, he had now gone from weighing 84 Kg to 116 Kg. He stared at his own mirror image for a while. Although the age of his clones remained at 46 years old, Raphel felt as if he were over a hundred. He had already died many times. Was this really his true self looking back at him from the other side of the mirror? Just a regular job, he thought. Accepting yet another mission from the Court Chamberlain and the Sarum Family, Ordo set out to deal with a special set of rouge drones in an old military complex in the system of Irmalin, deep into the low security systems of Khanid space. 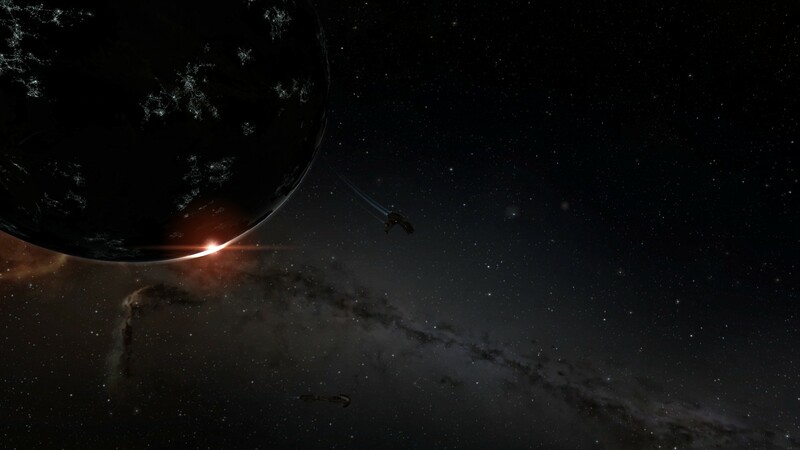 As he entered the system, he gazed at the Irmalin star, taking in the beauty of it as it came into view. He activated his warp drive with a single thought and headed towards his mission objectives. Upon entering the dreaded site, Ordo saw and focused his camera drones on the drone hive. He willed his Coercer-class destroyer, “The Ouroboros” towards the waves of malicious drones heading his way, closing in even further as he activated his afterburner systems. Upon reaching his optimal range, he focused his thoughts to his lasers and fired beams of white multifrequency, destroying every drone in his wake. He was just about to burn towards the last remnants of drones and his main objective; the drone hive, when he saw it.. In the middle of the nothingness, it stood. Majestic as anything he’d ever seen. A rectangular prism of some sort. A monolith if anything. Blackness incarnate, still reflecting the darkness of the space around it with unmatched perfection. Puzzled and hypnotized, Ordo decreased the distance between him and the giant monolith, as if drawn to it. As he closes in, just a few kilometers away, the huge object infront of him engulfs all of his vision. He eagerly tries to get any sort of information from his sensory relays, trying to identify the object without success. Ordo remained transfixed as the stars that was reflected on the surface of the magnificent structure starts to collaborate, move and gather in a form of center right infront of his eyes. He and hardly notice, or even care, that he is being targeted by the remaining drones who are defending their motherly hive. As he was lost in the translation of what stood before him, the last thing he percieved was the faint sound of alarm that his ships armor and structure was in critical states, before peering into a white light with the deepest part of his mind and going into a state of cataclysmic blissfulness..
Milliseconds later, Ordo opened his eyes, and is greated by a familiar looking servant of his as he realized his ‘old’ body was long gone, somewhere in the cosmic expanse, and that a clone of Raphael Ordo had been activated. Meanwhile in the Genesis region, Dead End system, a lone Heron-class frigate has taken refuge near one of the system planets and launched its probes into space. The Captain of the Heron “Peria II” remained quite as he repeatedly hits the scanning and survey buttons on the main console of the starship. – “Captain! We need better results! Otherwise we risk mutiny being in these parts of space. The crew is already talking of wierd things they’ve seen and going crazy about this region being haunted!” one of the crewmembers pledged. – “We will go nowhere until we find what we are looking for..” said the Captain in a harsh voice, “My sources tells me that we shall find valuable things here.“. – “No, not directly.. And no, you may not ask.” the Captain answered his crewman. A moment later he uttered “But I do know now… And could you be so kind and go tell the boys it looks like we need a bigger cargohold..“, he said with a grin while peering at the screen with the probing results, revealing a Coercer-class destroyer on scan. The small chamber opens with a sworling sound as the air-decompression is being emptied. The eyes of the newly awakened clone starts to flicker and then suddenly opens with a flash. These newly inhabited bodies always feels a bit odd the first minutes of the waking process. Raphael was all too familiar of this sort of transfer of the conciousness. The various cybernetics and implants implemented in this particular clone sure did their tricks; His audio sensibility was greatly enhanced, allowing him to almost hear the servants heartbeat from meters away if he concentrated. His vision was also different; colours had become more clear and vivid than before, and he was able to pick up even the smallest details of his servant’s fine clothing. And as he started moving his arms and legs to step out of the cloning chamber, he clearly noticed that even his skin had hightened sensibility in his fingers and feet. He felt the striking coldness of the metallic floor as he took a step outside..
“Just like any other day” he thought to himself. Since some time, Ordo had been tasked in doing missions for the Court Chamberlain himself. The Amarr Empire was always in need of talented individuals, especially capsuleers, willing to sacrifice their clones while putting an effort into defending imperial assets within the Empire. While his standings with the Amarr had been greatly enhanced as he had joined the well known military arm Praetoria Imperialis Excubitoris (PIE), and gained the confidence of even the Court Chamberlain as an non-Amarr, Raphael couldn’t help but feel that something was missing. Days to and end he could find himself killing hundreds of criminals and enemies of the Empire, all the while he didn’t feel the slightest remorse, or even accomplishment. He walked up to his capsule, marked with the number “23”, and walked into it. As he merged with the green liquid inside it, all matter of tubes and cords were automatically inserted into the cybernetics sockets connecting into his upper and lower spinalcord. In his mind, the Punisher-class frigate came into view from the eyes of his camera drones. Raphael set his auto-pilot on a destination within The Bleak Lands, the inner capsuleer warzone, as he departed from Khanid Prime. You are currently browsing the archives for the EVE category.